CFS Falconbridge (1952-1993) - A Cold War Pinetree Line Canadian Forces Radar Station first established in 1952 near Falconbridge, Ontario as RCAF Station Falconbridge. Initially manned by the 33 AC&W Squadron and assigned a site ID of C-9. On 10 Aug 1967 the base was renamed Canadian Forces Station Falconbridge. Closed in 1985. 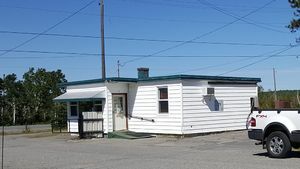 Former Falconbridge CFS Gate Shacks. Former Falconbridge Officers' and Transient Quarters. 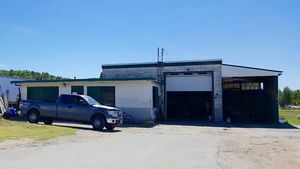 Former Falconbridge CFS Consolidated Mess Building. On 19 Jan 1956 the two ISG-98s were dismantled and one stored in each of the separate towers. The two TPS-501s were then moved from the main building onto the separate towers. The ISG-98s were shipped back to the depot on 4 Apr 1956. The height-finder saga continued with the installation of a separate FPS-6 height-finder tower and the acceptance of a FPS-6 height-finder radar on 5 Oct 1956. Blanking issues initially led to some problems but they were resoved. A second FPS-6 tower and radar set was installed and the TPS-501s were removed. This second tower was completed with a radome on 8 Oct 1960 and the FPS-507 (Canadian version of FPS-6) was accepted on 2 Nov 1960. The FPS-3 search radar was modified, became an FPS-508 (Canadian version of FPS-20) and was accepted for service on 3 May 1960. On 6 Sep 1960 the Mark X IFF equipment was changed out for new the GPA-501 (SIF) equipment. With the changes implemented in 1960, the site radar equipment was prepared and configured for the coming SAGE System operation. In 1962 a SAGE Annex building was constructed at the rear of the main operations building and the FST-2B was installed in preparation for SAGE operation. In 1963 Falconbridge was declared SAGE System ready and the unit designation was changed to 33 Radar Squadron in 1964. As a SAGE radar site the unit reported to the 23 NORAD Region in Duluth, Minnesota, Duluth SAGE Direction Center DC-10, but their data was also fed to the North Bay SAGE Direction Center DC-31. 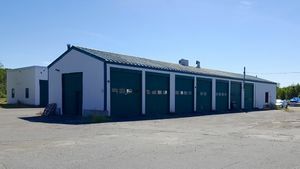 In March 1972, a detachment of the Air Weapons Control and Countermeasures School (AWC&CS) located in North Bay was established at Falconbridge CFS. The school taught the TQ-3 level Air Defence Technicians Course. With the SAGE System deactivation in 1983, the Falconbridge radar site became part of the Canada East ROCC, which was declared fully operational in August 1984. The Squadron was deactivated in December 1985 and the site closed 1 Nov 1986. 15 Aug 1952 - Assigned No. 209 RCAF Radio Station Falconbridge. 1 Oct 1952 - Designated as 33 Aircraft Control & Warning Squadron, RCAF Station Falconbridge. 1964 - Designated 33 Radar Squadron assigned to 23 NORAD Region, Duluth, Minnesota. Aug 1984 - Assigned to Canada East ROCC. Dec 1985 - Ceased operations. 1 Nov 1986 - Falconbridge closed. The physical plant of the site was divided into the main site, a cantonment area, a housing area and radio sites. The main site was located on a hill and housed a large four story operations buildings, two flanking radar towers and later two separate radar towers and a SAGE building. The cantonment area below housed the enlisted barracks, the bachelor officer's quarters, the orderly room, a combined mess, the motor pool and other support buildings. 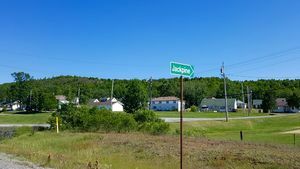 Apart from the main site but adjacent to the cantoment area was a 101 unit housing area for married personnel and a small trailer park. Initially, a radio transmitter site and a separate radio receiver site were located on/near the main site. The SAGE System required a separate Ground to Air Transmitter/Receiver (GATR) radio site and that was located near the airport. It housed the radio equipment for directing aircraft intercepts from the SAGE System. 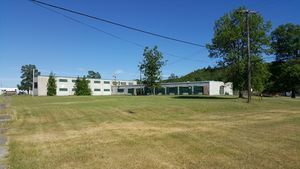 Former Falconbridge CFS Housing Units. 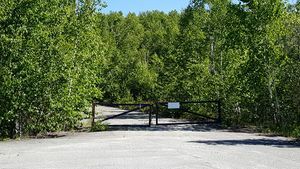 Locked Gate on the Road to the Former Falconbridge CFS Main Site (now leveled). Private property. Main site demolished and leveled. 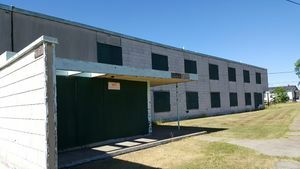 Cantonment site has some buildings in use by a development company but the remainder are boarded up. The housing area is in use with some units upgraded. The road to the main site is chained and locked. This page was last modified 21:27, 7 January 2019 by John Stanton. Based on work by Bill Thayer.